Not that very colorful, but it is enough for this flowers theme design. Visit Scenic Sunday here, and Color Caroival here. Wish you have a great weekend. where is this? Disney land? Glad you too practise hibernating the lily bulbs. I did have dark red type, my photo was admired all over the world. Unfortunately I can't find it among my archives, and I am surprised that I did not post it before. You are right, the dark red ones are more impressive. We can exchange notes, wish I knew you five years ago. You can still go to NTU, to Nanyang View. You will see my giant neem tree and my curry leaf tree. I have left 3 year, but people still remember Aunty Ann, because I was planting everywhere. Great idea for scenic Sunday photo. 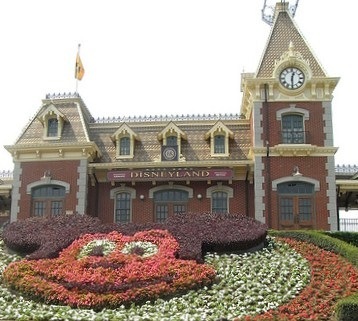 I love Disney World and Disneyland and I remember they both had this same flower arrangment with Mickey at the entrance. Disney does know how to display the flowers.